ATHENS, Ga. – The 14th-ranked Georgia football team practiced for approximately two hours in full pads Tuesday as preparations continued for the upcoming game against No. 9 Auburn. Saturday’s game will mark the Bulldogs return to Sanford Stadium for the first time since a 44-17 win over Vanderbilt on Oct. 4. 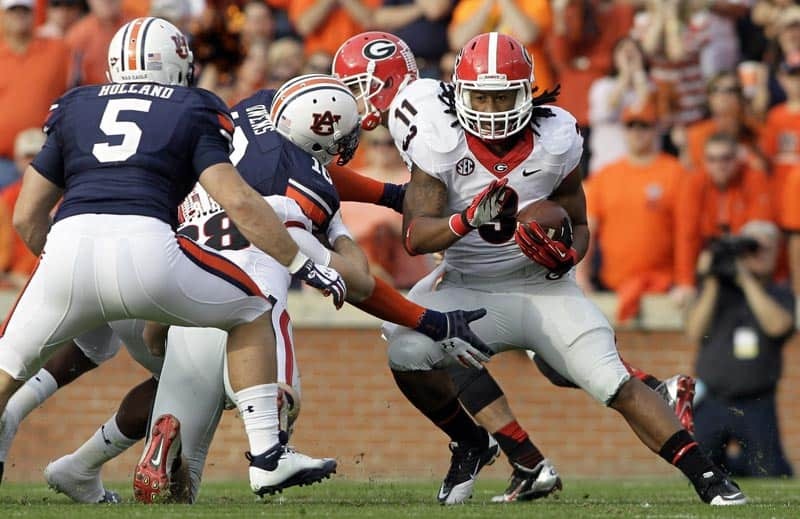 The matchup between Georgia and Auburn features two of the SEC’s most potent offenses. The Bulldogs are ranked first in scoring (43.0 points per game), while the Tigers are third (38.7), and Auburn leads the league with 286.4 rushing yards per game, and Georgia is second (256.3). Georgia (7-2, 5-2 SEC) and Auburn (7-2, 4-2) will meet for the 118th time Saturday with kickoff slated for 7:21 p.m. ET. Auburn leads the all-time series 55-54-8, but the Bulldogs have won six of the last eight meetings, including the last three at Sanford Stadium. The game will be televised by ESPN. Brad Nessler will handle play-by-play duties, Todd Blackledge will be the color analyst, and Holly Rowe will serve as sideline reporter.